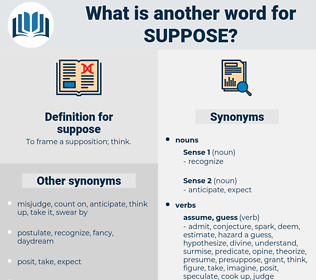 What is another word for suppose? To frame a supposition; think. be a great/firm believer in something. makes off top one's head. give (full) rein to something/give something (full) rein. foresaw, AM, cases, think, believe, expect, suggest, daresay, suspect, doubt, speculate, understand, imply, gather, consider, feel. AM, guys, needless, think, believe, expect, suggest, pretend, suspect, speculate, imply, consider, feel. 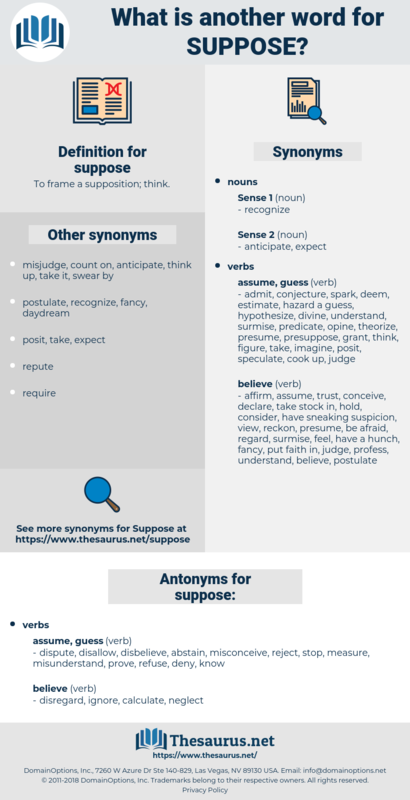 dispute, disallow, disbelieve, abstain, misconceive, reject, stop, measure, misunderstand, prove, refuse, deny, know. belie, find out, learn, discover, establish, question, conclude, validate. I suppose we could not go to Cowes, Sue?